What Is an Oilfield Operator? - Roska DBO Inc.
We are often asked, "What exactly does a gas plant or field operator do? What industry experience relates well to operations? What schooling do you recommend to get your foot in the door? Do I really have what it takes to do this?" This page helps you answer those questions and provides career guidance based on our decades of hiring experience and knowledge of what industry leaders are looking for. Mouse over each box or headline to see the answer. 1 What exactly does a gas plant or field operator do? 2 What industry experience relates well to operations? 3 What schooling do you recommend to get my foot in the door? 4 Do I want to do this, and do I have what it takes? That depends on the type of facility or producing field. 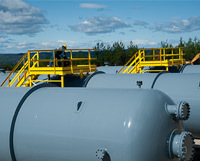 A gas plant operator typically takes care of the day-to-day operations of a natural gas plant or processing facility. The type of equipment and processes within a plant vary. They are designed and selected to convert different makeups of raw gas (like simple or "dry" gas, gas rich in natural gas liquids like propane, and/or "sour" gas containing hydrogen sulphide) into one or more saleable products. Gas plant operators are responsible for ensuring the facility's systems are running smoothly and making any necessary changes to optimize throughput and operating efficiency. They perform regular checks and keep records of temperatures, pressures, concentrations, and flows. They also perform basic tests on the gas and chemicals at various processing stages, and do minor equipment maintenance and housekeeping. Typically, plant operators work 12-hour day and night shifts and receive a shift differential, earning slightly more for nights. Gas plants may be located near cities or residential areas, in rural areas requiring some travel, or in remote locations requiring operators to stay in camp. While a gas plant operator helps run a plant or processing facility, a field operator ensures that oil or natural gas production moves continuously from the wellhead "downstream", i.e., to the oil battery, gas plant or processing facility. Field operators typically move from well to well and are responsible for optimizing production of the gas or oil wells that are on their "field run". Like a plant operator, they may also deal with compressors or dehydrators within their field run. They may also manage oil batteries. Oil batteries are comprised of equipment like treaters, water disposal and storage units (those upright rows of storage tanks that you often see at well sites). If their field is in a remote location, accessing well sites may require travel by ATV/UTV, snowmobile or helicopter, as well as living in camp. Rotational work is common for the field operator, often involving eight days of 10-hour shifts followed by six days off. Unlike plant operators, field operators usually work days. Evening call-outs can occur if maintenance or production issues arise at a well site the operator covers. For an outline of the typical work day of a production field operator, click or tap here. Any industry field experience is helpful. It helps show that you're familiar with working in remote locations, cold climates, shift work, safety procedures and mechanical systems. Any oilfield-related tickets are important (H2S Alive, First Aid, etc.). Testers gain experience at the wellhead and have knowledge of calculating production as well as using separators and vessels. There is no industry-standard education for plant or field operators in Canada. A minimum of a Grade 12 education with an aptitude for math, computers, mechanics, chemistry and/or physics is considered ideal. We recommend considering the three post-secondary programs listed below. Our customers show a preference for candidates with these certifications. They are often included in the customer's pay-scale system for advancement. Many customers are willing to take on and train green operators with a Fourth Class power engineering certification. One or more operators holding power engineering certification through the Alberta Boiler Safety Association (ABSA) or the British Columbia Institute of Power Engineers (BCIPE) are frequently required to be on-site at facilities, depending on the facility's size. There are five levels of certification. The lowest level, Fifth Class, will not help you much in the oil and gas industry and, because it isn't a prerequisite for the Fourth Class certification, we recommend you skip directly to the Fourth Class program. Power engineering certification can be completed at various schools, on campus or by distance education. SAIT and NAIT in Alberta are commonly used post-secondary institutions, and many other schools are also available. Students completing this course on campus at SAIT or NAIT will also be able to complete their steam (firing) time at the school's lab. If you opt for distance education you will need to find an employer with an approved facility who will help the candidate gain their "steam time". Although it can take time to find such an employer, this approach offers networking benefits and might lead to a full-time position. If considering a different school for on-campus attendance, check whether it has a lab for the steam time or whether it provides assistance in finding an employer for securing steam time. This course can also be completed through SAIT and affiliated schools either on campus or by distance education. It consists of four modules that provide a strong knowledge base: 1) Field Operation, 2) Plant Equipment, 3) Plant Processes and 4) Auxiliary Equipment. We find this course beneficial for candidates interested in pursuing a career in the plant. Fourth Class power engineering, however, seems to have an edge in getting one's foot in the door. This course can also be completed through SAIT or affiliated schools, either on campus or by distance education. It consists of four modules: 1) Production Overview, 2) Field Production, 3) Field Operations and 4) Process Operations. In our experience, this course has helped candidates land junior operating positions in the field, but is best paired with some industry experience. Being accountable, every day, to a hard-working team and a demanding supervisor.